Porsche has announced details of its GT3 Cup Challenge for 2012, which will have a new six-weekend, 12-race calendar and culminate in a season finale alongside the Porsche Carrera Cup GB - and supporting the British Touring Car Championship - at Silverstone on October 6/7. Open to any 911 GT3 Cup race car from the 2009 model year or earlier, the series is designed to be a perfect stepping stone for drivers aiming to move up to the Carrera Cup GB in subsequent seasons. 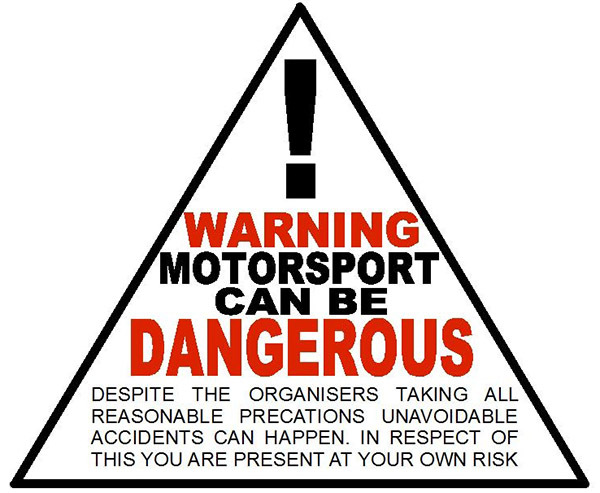 It is also ideally suited to younger racers with some backing, as well as competitors graduating from track days. The series is open to drivers with a National B race licence. For 2012, the GT3 Cup Challenge moves under the control of Porsche Cars GB, providing closer ties to the UK headquarters of the German sports car marque, the world’s biggest manufacturer of race cars. Links to the premier Carrera Cup GB will be strengthened; both series will share a pre-season Test and Media Day at Silverstone in March, along with a spectacular end-of-season Awards Night. The GT3 Cup Challenge is expected to feature two classes; Class One will be for ‘Type 997’ 911 GT3 Cup race cars up to and including the 2009 model year. There will be two minimum weights to balance performance between the two specifications of car from this period. Class Two will be for all earlier ‘Type 996’ 911 GT3 Cup cars. Races will be of 25-30 minutes duration wherever possible and the calendar is designed to keep time away to a minimum to help contain costs. Leading teams from the Carrera Cup GB will be fielding cars in the GT3 Cup Challenge, with full-season budgets from £50,000, or from £30,000 if drivers own their cars. A GT3 Cup Challenge race centre will be operational at all events, offering hospitality for drivers, families, guests and team members. Porsche Cars GB will provide further support with a technical service to give drivers the best chance of completing their race weekend as planned. The prize package for the series will be unveiled shortly, along with filming and broadcast details. Another new name on the Porsche GT3 Cup Challenge grid this season will be that of David Willis-Hargreaves, who will step up from track days to race his 2005-model 911 GT3 Cup. David, from near Banbury, has taken part in track days for three or four years in Porsche 911 GT3s and has now decided to make a step up with the support of racing instructor Gary Marsh. “Gary suggested I try racing and I’ve done no racing at all so far, other than karts for fun and mountain bikes,” said David, who used his former Supercup car in track days last year. The duo will do much of the work on the car themselves, with support from Fearn Sport when required. David is likely to miss one or two races, so Gary will take over at the wheel for those events. 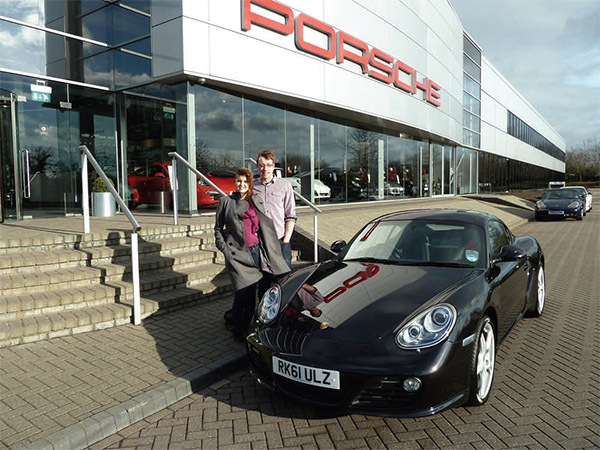 Oly Mortimer, the 2011 Porsche GT3 Cup Challenge GB Driver of the Year, drove away from Reading last month in a brand new Porsche Cayman S.
The car, which Oly gets to keep for a year, was presented by Marion Barnaby at the Porsche Cars GB Head Office. 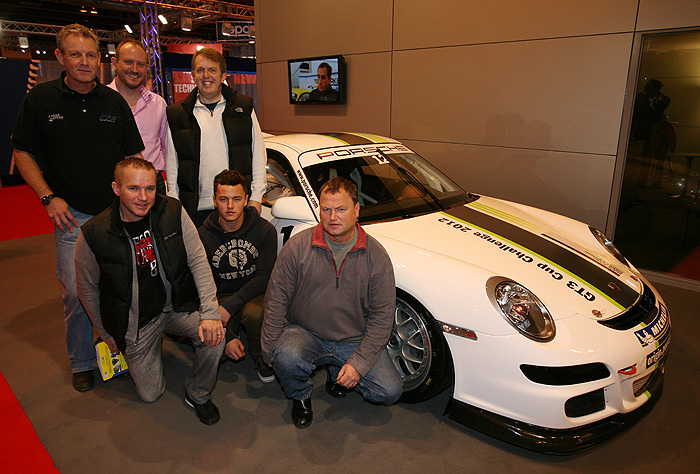 The launch of GT3 Cup Challenge GB at the Autosport Show has generated a great deal of attention from a range of high-calibre Porsche racing teams. There are now a range of opportunities for drivers wishing to drive in the series. A number of teams are offering complete ‘arrive and drive’ packages, whereby they’ll completely tailor the amount of testing and training to suit drivers’ experience, ambitions and budget. For drivers wishing to run their own GT3 Cup car, there are teams that are offering services to assist with the running, set-up and mechanical up keep of their cars through-out the season. Finally, for drivers wishing to purchase a GT3 Cup car of their own, there are teams with cars for sale, with either the option to help the new buyer run the car or to allow the driver to run it completely independently. Former single-seater racer James Birch has signed with IN2 Racing for a full programme in the Porsche GT3 Cup Challenge. 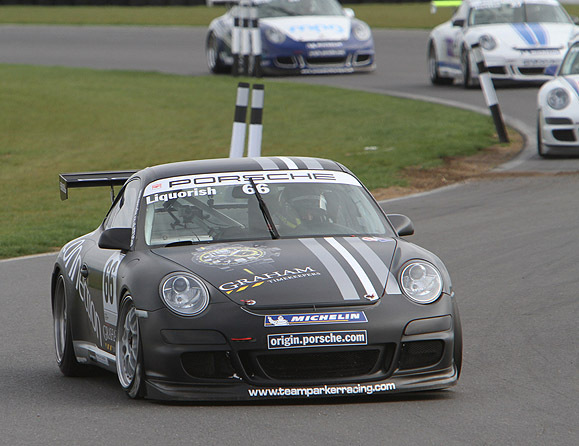 The 22-year old racer has secured sponsorship from MPG Quantity Surveyors for his graduation and hopes that the campaign will boost his chances of racing in the Carrera Cup GB in 2013. Birch raced karts as a youngster and then moved into Formula Vee, winning the 2009 European Formula Vee title. He competed in Formula Renault BARC in 2010 and then raced Radicals in 2011. Mmm - wonder how much more that would cost over what I'm doing this season...? 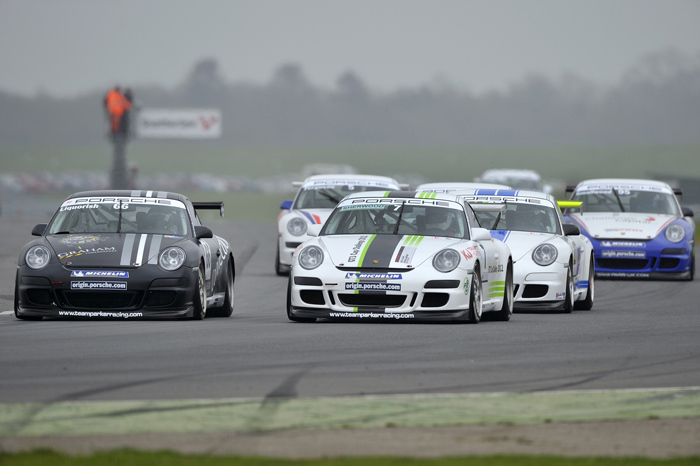 The 2012 Porsche GT3 Cup Challenge GB kicks off at Snetterton over the Easter Weekend (7/8 April) with two 25-minute races on the 200 circuit at the East Anglian venue. The Porsche GT3 Cup Challenge is managed by Porsche Cars GB alongside the Carrera Cup GB and is set to grow as the season develops, with steadily building competitor interest. The series has recently received a further boost with the granting of championship status for the six-event, 12-race season. The GT3 Cup Challenge is for the earlier cars from 2009 or before, including the 996-model cars from up to 2006. Lining up for a race each day will be pre-season pacesetter James Birch, who previously ran strongly in the Formula Renault BARC Championship. The 22-year old racer from Amersham set the pace during the recent pre-season test day at Silverstone and his IN2 Racing entry should be right at the head of the action at Snetterton. Fresh from the opening races in the Carrera Cup GB at Brands Hatch, Team Parker Racing will field up to three cars at Snetterton including those of Steven Liquorish and Neil Houston. Silverstone-based Scotsman Houston will make his Porsche racing debut after previously campaigning Ginettas, while Liquorish already has a year’s experience under his belt in these cars. Another team running in both the Carrera Cup GB and the GT3 Cup Challenge is Parr Motorsport and they will be supporting Peter Smallwood as he starts his third season of racing with his 997-model 911 GT3 Cup. Also racing in Class 1 for the 997-model cars is John Ferguson in one of the cars entered by Dublin-based Ask Racing. The Irish squad, headed by Alan Kessie, is also represented in Class 2 for the earlier 996-model cars with an entry for Co Wicklow racer Tom Hallissey. His rivals will include Mark Cowne in the car tended by Silverstone-based Fearn Sport. 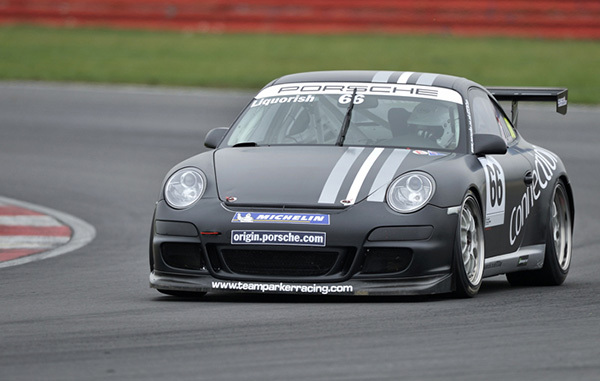 Steven Liquorish and James Birch were the race winners as the 2012 Porsche GT3 Cup Challenge GB got off to a flying start at Snetterton over the Easter Weekend (7/8 April). After some great battling across two 25-minute races, Liquorish and Birch took a win apiece as Justin Sherwood, Neil Houston and Peter Smallwood all claimed overall podium finishes. With qualifying starting on a wet but drying track, the closing minutes proved to be crucial as all drivers switched from wets to slick tyres mid-session. The times tumbled in the closing moments with four drivers in contention for pole in a dramatic last five minutes and it was Birch (IN2 Racing) who judged it best to take pole with a best lap of 1m14.718s. Liquorish (Team Parker Racing) and Sherwood (Team Parker Racing) were within a second of the pole time, with John Ferguson (ASK Racing) slipping back to fourth after taking pole at one point. “I made the decision to come in early for slicks and it was drying all the time,” said Birch after an impressive run in challenging conditions. “It was still damp in places,” confirmed Liquorish who claimed pole for race two from Sherwood and Birch based on their second best laps in qualifying. The opening race of the season, run on a dry track, delivered an absorbing contest, a first Porsche win for Liquorish and a clean sweep of the overall podium for Team Parker Racing. Liquorish set the seal on his landmark victory with a rocket start to shoot straight into a handy lead while Birch didn’t get away so well and had to fend off Ferguson and Houston (Team Parker Racing) in the early laps. Then, just as he started to chase after Liquorish, Birch spun at Nelson and clipped the barriers. With damage to a radiator, he was forced into the pits and retirement. Up front, Liquorish was driving superbly to set the pace, but now Ferguson set about hunting the leader down. Little by little the gap came down, but then came a safety car period while marshals dealt with some debris. Liquorish had never led a re-start before, but handled it well to retain his lead with less than four minutes to run. Ferguson, Houston and Sherwood went after Liquorish over the closing three laps and into the final lap Ferguson sensed his chance. Pushing hard through Riches, Ferguson spun and couldn’t re-start, bringing to an end a very strong Porsche debut. Meanwhile, a missed downshift from Houston gave Sherwood the chance he needed and the former F3 racer dived through to grab second. Smallwood (Parr Motorsport) bagged fourth behind Houston having battled with Sherwood in the opening laps, while Mark Cowne (Fearn Sport) claimed Class One for the 996-model cars in only his third ever race. “I was definitely race rusty,” said Sherwood after only his third race in nine years. “It’s been a long time since I’ve driven a race car and I was learning with every lap.” Houston, meanwhile, was very pleased with a podium on his first Porsche race. “I couldn’t ask for any more,” he said. “I went in a fraction too fast and it got away from me,” said Ferguson after his attacking drive went un-rewarded. Sunday’s race was full of incident and drama as light rain at the start made conditions truly challenging for the slick-shod field. Sherwood got away best to lead under intense pressure from Liquorish as Birch made a slow start and dropped to fifth behind Houston and Ferguson. Into Riches for the third time, Liquorish fell foul of the conditions and had a high-speed spin, which delayed Houston and allowed Ferguson briefly up to second ahead of the charging Smallwood. But it was Birch who was now on the move and he jumped Houston for fourth before Ferguson launched a big attack at Murrays and briefly re-took second from Smallwood before running wide and being bundled back to fifth as four cars ran neck and neck for second. Houston snatched second in the confusion and set a cracking pace as he led the chase of Sherwood, but Birch went with Houston and finally battled ahead as they braked for Riches on lap 13. Lap by lap the lead reduced and by the end of lap 17, Birch was right on Sherwood’s tail. Into Riches for the 18th time, Birch attacked and the cars touched. They both went off and while Sherwood bumped the barriers and retire, Birch managed to rejoin still in the lead, but without the car’s front splitter. Houston still chased but Birch held on to take the flag as Smallwood claimed a fine podium finish in third while Liquorish recovered to fourth after Ferguson retired to the pits with an engine problem. Cowne again took Class One spoils as he learnt about driving on a greasy track for the first time. Race One: 1 Steven Liquorish; 2 Justin Sherwood; 3 Neil Houston. Class One: Mark Cowne. Fastest lap: John Ferguson 1m13.939s (96.60mph). Race Two: 1 James Birch; 2 Neil Houston; 3 Peter Smallwood. Class One: Mark Cowne. Fastest lap: Birch 1m13.824s (96.75mph). Provisional overall points after round two: 1 Liquorish 35; 2 Houston 34; 3 Smallwood 30; 4 Cowne 24; 5 Birch 22; 6 Sherwood 18. Class One: 1 Cowne 28. Next rounds: Rockingham, 19/20 May. Not a particularly big grid is it? If someone would like to sponsor me, I'd happily add to the numbers next season! The Rockingham Motor Speedway is the setting for the second event in the 2012 Porsche GT3 Cup Challenge GB with two 25-minute races over the weekend of 19/20 May. Boosting the grid will be three drivers making their debut in the series. The Porsche GT3 Cup Challenge is managed by Porsche Cars GB alongside the Carrera Cup GB and is growing as the season develops, with steadily building competitor interest. The Rockingham entry is the best yet for the championship and the series has recently received gained championship status for the six-event, 12-race season. The GT3 Cup Challenge is for the cars from 2009 or before, including the 996-model cars from up to 2006. Heading the entry will be the drivers who shared the race wins at Snetterton when the season opened over the Easter weekend. In two exciting races, James Birch (IN2 Racing) and Steven Liquorish (Team Parker Racing) took a win each and they head the entry for Rockingham. Former single-seater racer Birch will surely be strong around the challenge of the Corby track, where the flat out banked Turn One is one of the fastest corners on the schedule. However, with his first Porsche win under his belt with a polished performance at Snetterton, Liquorish will be a big threat. Others with a visit to the podium as a minimum target at Rockingham include Northampton-based racers Peter Smallwood (Parr Motorsport) and Neil Houston (Team Parker Racing), while Justin Sherwood (Team Parker Racing) showed at Snetterton that he is a real force to be reckoned with. Although former F3 racer Sherwood only made his debut in the series at Snetterton, he was immediately close to the pace. Birmingham-based Irishman John Ferguson was another star at Snetterton in one of the cars entered by Dublin-based Ask Racing. He has the pace to win at Rockingham, while two drivers will make their GT3 Cup debut in Class 1 cars: Guy Riall (Almara Racing) and Mark Flaherty (Redline Racing) will both be welcome additions to the growing grid. Ferguson will be joined in the Ask Racing team by a Class 2 entry for experienced Co Wicklow racer Tom Hallissey. His class rivals will include Mark Cowne (Kruger Cowne) who took a double victory at Snetterton. After qualifying at 11.15 on Saturday, round three will start at 15.15, with round four at 12.05 on Sunday. Former double British Rallycross champion Mark Flaherty is the latest driver to join the Porsche GT3 Cup Challenge GB and will make his debut at Rockingham this weekend (19/20 May) in rounds three and four of the season. Flaherty is returning to the sport after a break of 14 years and will make both his circuit racing and Porsche debut at Rockingham. Previously, all his competition experience has been on the mixture of gravel and asphalt of rallycross tracks. Flaherty, now based in Berkshire, won the British Rallycross title in 1991 and 1992 at the wheel of an MG Metro 6R4 and then competed in Europe against all the biggest names in the sport. He stopped competing in 1998 to concentrate on business and has now decided that, aged 49, it is time to return to competition. Flaherty will join Redline Racing to contest the balance of the GT3 Cup Challenge GB. “I’ve never raced a Porsche and I’ve never raced on a circuit, so I’ve got a lot to learn,” he says. “It’s a totally different driving style and a totally different car. I’ve already had a run with Glynn Geddie and I can’t wait to get started.” Backing for the programme comes from Wokingham-based Flaherty Homes. Birch secures double victory at Rockingham. James Birch won both races at Rockingham as the Porsche GT3 Cup Challenge GB visited Northamptonshire for rounds three and four. There were also podium finishes for Peter Smallwood, John Ferguson and Justin Sherwood as the series once again produced some thrilling racing. he said. John Ferguson (Ask Racing) recorded his best qualifying result so far with second position, just under half a second shy of Birch’s best time. Championship leader Stephen Liquorish (Team Parker Racing) was third fastest as the top three were separated by less than seven tenths of a second, and considerably faster than the rest of the field in challenging conditions. They would line up in the same order for the second race. The first race of the weekend was an action packed affair with drama right until the final corner of the final lap. The circuit was much drier than it had been in qualifying so the whole field opted to run on slicks. Birch managed to hook up a near perfect start to lead the pack into Deene Hairpin with fellow front row starter Ferguson holding second and Justin Sherwood (Team Parker Racing) up to third after managing to get away better than Liquorish who ran fourth. Whilst Birch streaked clear by 3.6 seconds over the first two laps, Sherwood began to exert pressure on Ferguson for second which allowed Liquorish to close up on the pair but before a three way battle for second was allowed to develop, Sherwood slowed with a right rear puncture and was forced to pit to replace it, dropping him to the back of the field. This left Ferguson and Liquorish to dispute second place for the rest of the race. Liquorish looked the quicker of the two but he could not find a way through as Ferguson robustly defended and countered every move. As they went onto the final lap Ferguson looked to have done just enough to hold on to second but Liquorish got alongside at Tarzan which put him on the outside for the final chicane, with neither driver wanting to concede position they both braked too late and ran onto the grass. Liquorish was so eager to get back on track first and claim second place that he spun. Neil Houston (Team Parker Racing) and Peter Smallwood (Parr Motorsport) who had been running fourth and fifth for most of the race arrived at the chicane just as Liquorish and Ferguson were scrambling back on to the circuit. This delayed Houston but Smallwood threaded his way through cleanly to take second place, his best result of the season to date, this was made all the more remarkable considering he had started from ninth. Ferguson recovered the quickest of the three drivers caught up in the mayhem of the final chicane to finish third with Houston fourth and Liquorish fifth. There was close racing all the way down the field including between two of the debutants of the series, Mark Flaherty (Redline Racing) and Guy Riall (Almara Racing) who were separated by half a second at the line for sixth and seventh, with Flaherty ahead. In class two, Tom Hallissey (Ask Racing) claimed victory. The last corner drama not only shuffled the finishing order but also gave Birch an emphatic winning margin of 19 seconds. “I’m really really happy. I got a good start, managed to get a bit of a gap and then just tried to hold it from there,” he said. “The car was fantastic,” said Smallwood of his charge through the field. While Ferguson admitted he was “delighted,” to secure his first podium of the season. The second race of the weekend saw Birch complete his clean sweep of victories but not by quite as convincing a margin as in the first race. He made another good start from pole to lead into Deene Hairpin despite the efforts of Neil Houston who having made a rocket start from sixth on the grid had momentarily run side by side with Birch. The majority of Houston’s good work was undone at Deene as Ferguson and Sherwood dived through demoting him to fourth just ahead of Liquorish who had not made a great getaway. There were more changes of position further round the opening lap as Sherwood swept past Ferguson at Tarzan to take second position. The eventful start to the race was swiftly neutralised as the safety car was deployed to remove Tom Hallissey’s car from the side of the track after he had connected with the barriers. At the restart Birch timed his bolt towards the line perfectly, catching Sherwood off guard and allowing him to make a crucial break away. Sherwood ran at a solid pace though and kept Birch honest by making sure that for the first few laps after the restart the gap was no more than two seconds, before in the later stages of the race Birch edged a little further clear to win by just over four seconds. Sherwood took a comfortable second position finish as behind him battle raged once again between Ferguson and Liquorish. The latter passed Houston for fourth at mid race distance and then closed the gap to Ferguson rapidly and spent the final eight laps shadowing his every move. However, Ferguson defended well for the second time during the weekend and held Liquorish off until the chequered flag to claim the final podium position. “It’s fantastic to make it two wins out of two and come out with full points, I’m very happy,” said Birch. “I came here to win both races and we’ve managed to achieve the dream,” he added. “I’m satisfied with that today, James ran a good pace and I did my best to keep up with him,” said Sherwood of his first podium of the weekend. Race One: 1. James Birch; 2. Peter Smallwood; 3. John Ferguson. Class One: 1. Tom Hallissey. Fastest Lap: Birch 1m23.738s (83.40mph). Race Two: 1. James Birch; 2. Justin Sherwood; 3. John Ferguson. Fastest Lap: Birch 1m22.216s (84.94mph). 1.Birch 66; 2.Liquorish 61; 3.Houston 60; 4.Smallwood 57; 5. Sherwood 42. Class Two: 1.Cowne 28; 2.Hallissey 11. Next rounds: Thruxton, 17th June. 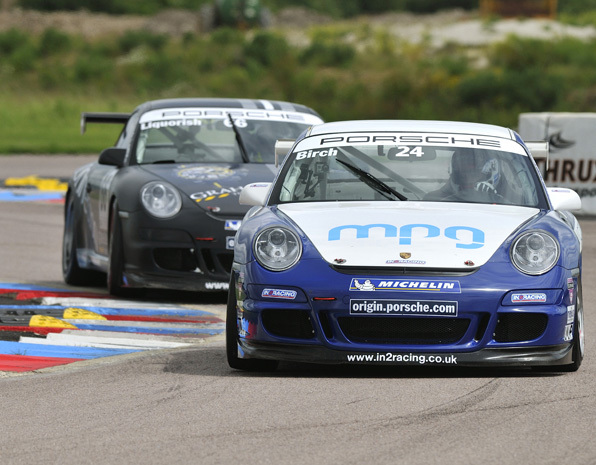 James Birch made it five wins from six races in the 2012 Porsche GT3 Cup Challenge GB at Thruxton on Sunday (17 June) with a peerless performance. In his wake, John Ferguson and Steven Liquorish battled hard for second and in the later race the place was only decided in Ferguson’s favour on a dramatic final lap. Only Birch (IN2 Racing) and John Ferguson (ASK Racing) went into qualifying with any previous race experience of the sweeping Hampshire track and Ferguson’s only prior race at Thruxton had been in Formula Ford 20 years ago. Sure enough, it was Birch who set the pace with an assured performance to take pole for round five with a best of 1m17.777s. “I’ve not been here for two years, but it is a circuit I like,” said Birch. “I love the fast, flowing tracks.” Birch also secured pole for round six with the fastest second-best qualifying time. Running second to Birch was Steven Liquorish (Team Parker Racing), the best of those with no prior experience of Thruxton. “It certainly wakes you up a bit,” he said after 10 laps of qualifying. Ferguson was third fastest for both races and admitted that there was room for improvement. “My lines around the fast bits are ridiculous: I’ll try and chase them in the race and learn from that,” he said. Racing newcomer Guy Riall (Almara Racing) was fourth, with Mark Flaherty (Redline Racing) fifth despite not getting a really good lap in. Wrapping up the top six was Mark Cowne (Team Parker Racing) after learning the track on a very wet track day earlier in the week. Birch didn’t get the start he wanted and was immediately bundled back to third place by Ferguson and Liquorish. The leading trio ran nose-to-tail over the opening laps but Birch was soon looking to re-assert his authority and he dived ahead of Ferguson on the exit of Noble on the second lap. “I haven’t quite got the hang of the starts yet,” admitted Birch. However, once ahead he drove an assured race to steadily build his lead and was later able to moderate his pace to preserve his tyres on a track where tyres are always under intense strain. “Thankfully I wasn’t under too much pressure,” said Birch after taking his fourth win from five races. While Birch controlled the race, things were far from settled in the contest for second. Liquorish had his hands full of the charging Ferguson and a trip over the kerb at the chicane took the front splitter off Liquorish’s car. “I then had absolutely zero turn-in on the fast left-hander,” reported Liquorish as he battled on. Ferguson’s dogged attack was rewarded when he edged into second on lap eight and the Irishman duly moved clear as Liquorish struggled with his ill-handling car. “I had a great start but I was still learning the circuit over the first few laps,” said Ferguson after a strong drive. For Liquorish, third was a case of damage limitation. “That was really hard work and very frustrating,” he said. Fourth place was in doubt until late in the race as Flaherty had to push on to defend from Cowne mid-race once Riall had dropped to the tail of the pack with a high-speed spin at Church. “I was hanging on to their coat tails,” said Riall after an impressive opening stint. Flaherty ran a solid fourth until his tyres started to fade and that helped Cowne close in. For several laps, Cowne defied his lack of racing experience to challenge for fourth, but then lost his splitter over the kerb at the chicane. Despite that handicap, Cowne did hold fourth for a couple of corners. Flaherty spun at the complex, but two corners later Cowne had the first of two spins that dropped him back to sixth behind the recovering Riall. All three had raced hard on their Thruxton debuts. Birch got a peach of a start for the second race of the afternoon and made the pace right from the start. He pulled clear of Liquorish on the opening lap and was then able to control the race from the front with another classy performance to extend his winning sequence to five races and extend his championship lead. “I just went for it with three or four quick laps and then tried to maintain the tyres after that,” said Birch after winning by over six seconds. “Brilliant: I couldn’t be happier,” he said after scoring 44 points in a perfect day’s work. Behind Birch, a fierce battle raged for second as Ferguson recovered from a tardy start to chase after Liquorish. For lap after lap it was neck and neck as both drivers pushed to the limit. Finally, it all came down to the last lap as Ferguson made his move with a bold attack at Church Corner. The cars touched and Ferguson was through. “I knew it was the last lap and he was struggling coming out of the Complex,” said Ferguson, who had a lucky escape mid-race when he hit a pheasant that was walking across the track. Liquorish was a disappointed third after fending off his rival until two corners from the flag. Flaherty slotted into fourth place, but had Riall and Crowne close behind and Riall challenged for several laps before a spin at the Complex dropped him to sixth. Instead, Cowne moved in to take up the challenge on Flaherty and the racing novice mounted a relentless attack on Flaherty. The places never changed, but there was still little more than a second between them after 25 minutes of racing. Race One: 1 James Birch; 2 John Ferguson +8.610s; 3 Steven Liquorish; 4 Mark Flaherty; 5 Guy Riall; 6 Mark Cowne. Fastest lap: Birch 1m18.376s (108.21mph). Race Two: 1 Birch; 2 Ferguson +6.606s; 3 Liquorish; 4 Flaherty; 5 Cowne; 6 Riall. Fastest lap: Birch 1m18.205s (108.45mph). 1 James Birch 110; 2 Steven Liquorish 93; 3 John Ferguson 69; 4 Neil Houston and Mark Cowne 60; 6 Peter Smallwood 57; 7 Mark Flaherty 48; 8 Justin Sherwood 42; 9 Guy Riall 39; 10 Tom Hallissey 8. Next rounds: Croft, 21/22 July.